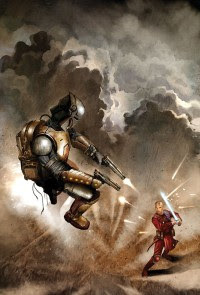 Faraway Press: The Online Home of John Jackson Miller: Knights of the Old Republic #42: Taking up the mask! Knights of the Old Republic #42: Taking up the mask! OK, folks, the frequency of posts here is exactly reflective of how busy I have been... but I'm not too busy to alert you to the arrival in better comics establishments tomorrow of Star Wars: Knights of the Old Republic #42, also known as "Masks." There has been a lot of speculation about this one, as it sheds light on unseen moments of the Mandalorian Wars and the lives of Revan and Malak. I won't promise that it answers all questions, of course — but I can promise some surprises. Should be a fairly healthy trivia section on this one once I have time, although you can find out an interesting fact about one of the supporting players in this story by checking out the latest edition of Star Wars Insider. In the meantime, enjoy, and be sure to drop me a line.